Breakfast, late night snack or anything in between these no bake chocolate almond energy bites are my new obsession! They are packed full of fibre, nutrients and they use this incredible chocolate almond butter from MUNCH that I cannot seem to get enough of. Ever since I made those blueberry oat snack bars a couple months ago I have been hooked! It was time to break away from my routine and get something new and exciting into my life. I bring to you, these chocolate almond energy bites! A mouthful to say but a mouthful of pure heaven. - Mix everything in a large bowl, roll into 1" balls and place on lined baking sheet. Cover and refrigerate for 2 hours. You may want a bowl of water around to dip your fingers as these can get sticky! All you have to do is roll them and eat them, that sounds pretty easy to me! You guys probably know by now that I have a little obsession with oatmeal and that is because it is just so damn versatile! 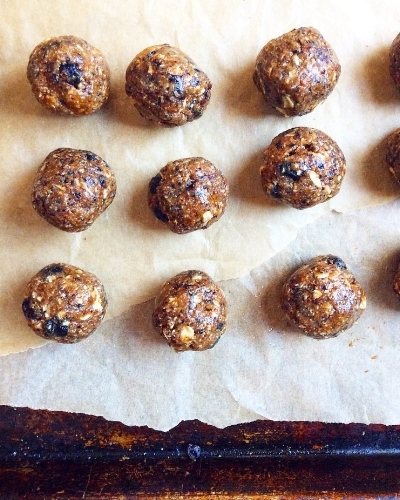 If you are eating oatmeal for breakfast, it can easily get boring and that is why I make energy balls like these ones and provided you with some other healthy oatmeal recipes! For more protein rich easy recipes that I LOVE click here and download your free e-book. Another really neat thing about this recipe is that for a lot of the ingredients, you should be able to shop and support a local business! Take this chocolate almond butter for example. Munch YYC stemmed from a passion to be healthy and the desire to become a part of YYC's growing young business community. That is a company I want to get behind and I encourage you to do the same with your local spreads/butters/baking goods. Most sweet snacks you can purchase from the store are loaded with sugar and can be heavily processed. That is why you should no bake your own! We all live a very fast paced life and small snacks like this to grab-n-go are perfect!